I recently spoke at FreedomFest in Vegas along with the world’s best and brightest minds, such as Steve Forbes, Senator Rand Paul, and Whole Foods CEO John Mackey. I discussed the growing global demand of resources and gold to a crowd of 2,000. Half of the group was attending for the first time, which demonstrates to me a growing curiosity to learn about macro trends shaping the world and affecting our investments. Among investors these days, a fellow commodity bull is about as rare as finding a positive story in the media, especially when you look at the results of metals and natural resources during the first half of 2012. Only four commodities on our periodic table pulled off a positive return. Wheat grew the most, rising 13%, followed by single-digit rises from corn, gold and copper. On the negative side, coal lost more than 19%, followed by crude oil (-14.1%), nickel (-13.6%) and lead (-12.3%). Fears of slowing global growth and how it will affect commodities have caused many investors to dig their heels in the ground and resist owning natural resources. Perpetuating this negative investor sentiment is the constant 24/7 news cycle punctuated with pessimism. His argument focused on the swelling population in China, and the fact that the world has experienced a “great paradigm shift” around 2000, when commodity prices, which were negative for decades, “abruptly reversed course.” He told the crowd, “in the long run, you can’t afford to miss this opportunity.” We agree. 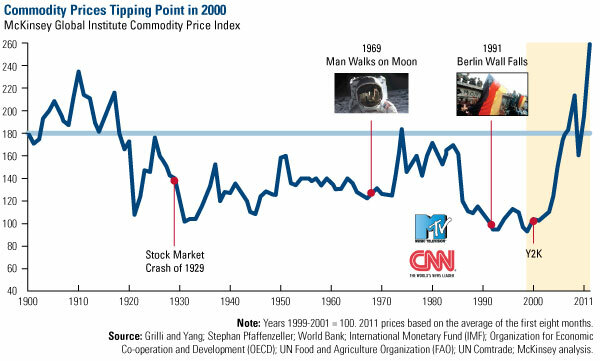 As you can see on McKinsey & Company’s chart above, the past decade shows a clear tipping point for resources. In 2000, I became the chief investment officer of US Global Investors at a time when no one wanted to touch resources. We recognized the significance of China and Eastern Europe ushering in free markets, believing this to be a positive change, with emerging markets as big beneficiaries of this massive shift. I like to use the metaphor of an ice cube to explain how new equilibriums can have significant effects. We all naturally understand what happens when you take ice out of the freezer. It changes form, from solid to liquid, but it’s still made up of hydrogen and oxygen.